The management of Boryspil International Airport (KBP) has tabled plans to become a gateway and distribution center for shipments purchased online. If realized, Ukraine’s largest airport would capitalize on the fast-growing e-commerce business and secure a share of it. But how to finance the ambitious and costly project is still an unsolved question. E-trade has become an extremely powerful economic driver, significantly influencing supply chains, emphasized Yevgeny Dykhne, First Deputy General Director of Boryspil Airport during the recently held Kiev International Economic Forum. Consequently, “we are increasingly focusing on this rapidly growing segment by creating the preconditions to developing Boryspil into a hub for e-commerce,” stated the manager. and early 70s allowing to accommodate about 40 tons of cargo per day, is completely outdated. Meanwhile, between 110 to 120 tons are turned over at Boryspil each day and night, since the airport – a major advantage – has no curfew but operates 24/7/365. However, its reputation was badly damaged back in 2013 with negative effects still felt today. In the spring of that year, a successful hostile raider attack against a local subsidiary of ground handler Swissport led to the total loss of all assets owned by the Swiss company. An assault orchestrated by Ukraine International Airlines’ majority shareholder Aron Mayberg, backed by local courts and ultimately tolerated by the government. A scandalous case that has caused a major stir all across Europe and even worldwide, sending a stern warning to potential foreign investors. Against this background, it will be a tough task to attract non-Ukrainian companies to finance the needed ground infrastructure tailored to e-commerce demands. But without private money the projected large cargo area, including the construction of a state-of-the-art sorting and distribution center for fast processing e-commerce shipments will hardly be fundable. With this in mind, airport manager Yevgeny Dykhne brought up plans for a public-private partnership, which would be responsible for carrying out the ground work and run the future freight facilities. Should this fail, the airport’s Director General Pavel Ryabikin advocated funding the project out of Boryspil’s own coffers. 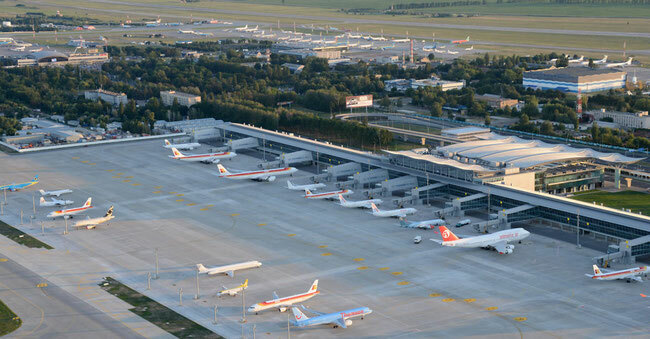 In the same breath he frankly admitted, however, that “the investment we need in the near future to realize the plans is very difficult to obtain.” A statement indirectly questioning the financial abilities of Ukraine’s largest airport. How much the entire project might cost, was not revealed by the airport management at the Economic Forum. So, it seems, that the final word on the project has not been spoken yet.